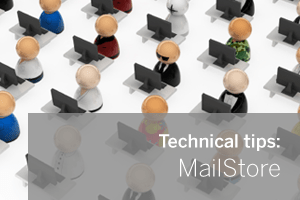 Depending upon on the design of your network, it may not always be possible to let MailStore Server automatically synchronise its list of user accounts with your Active Directory. If that’s the case, you way well find the alternative is to add users manually. For smaller number of users this isn’t an issue, however, if you have hundreds to enter and update periodically, you may quickly find yourself thinking there are better ways to be spending your time! Enter MailStore’s API which enables the administration of a wide range of tasks via its management shell. A list of commands supported by the MailStore management shell is available under ‘Administrative Tools > Miscellaneous > Management Shell’. You can run any command in this list manually from the management shell but you’re restricted to one at a time, which is where creating a script is useful. So let me step through each part of this command line to help explain what is happening here. This is the path to the MailStorecmd.exe executable, the quotes are needed due to the space in the path. Please note if you have installed MailStore to a different drive you may have a different path to your MailStore Server folder. Next we define which MailStore server we wish to control. I recommend executing the command locally on the actual MailStore server. Therefore we are simple connecting to the MailStore server using ‘localhost’. I have seen commands fail if you try to use the server name here so stick to ‘localhost’ whenever possible. This unique ID is the one for the MailStore server. Right click on this Microsoft Outlook profile and choose “Create Task” then “Copy Cmd Line”. Cancel and delete this profile, it’s not needed. Next we need to add the valid MailStore server Administrator username and password used to log into the MailStore client (default is ‘admin:admin’). From now on we’re defining the actual MailStore command we wish to run and any parameters it requires. 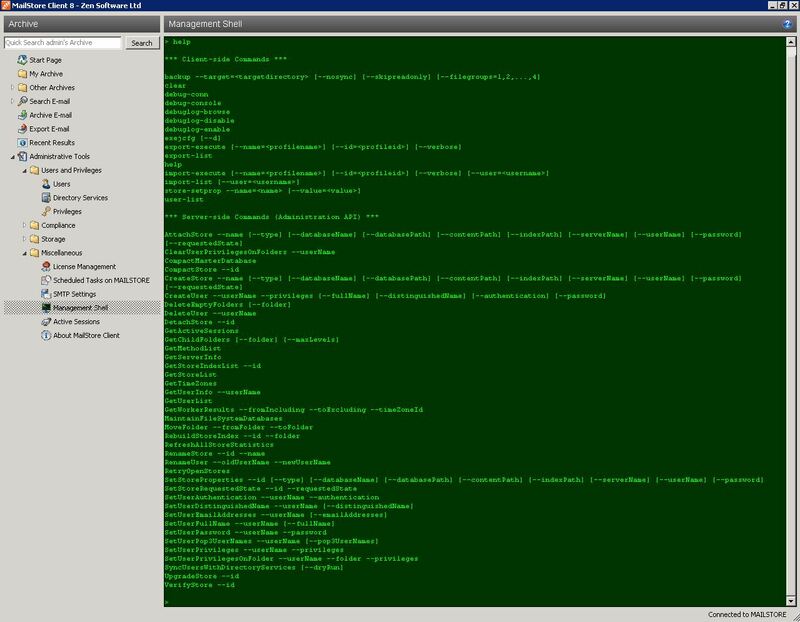 ‘-c’ is the switch to run a command and in this example the MailStore management command we are running is called ‘CreateUser’. Create a new user called “fred.bloggs” (please note this field must all be in lowercase). And finally assign the account a password of “password123”. So now that you can see how we can create a single user from the Windows command line hopefully it’s evident that it’s only a simple step further to use this format to create a script that simply repeats this command customised for each user one after another. There are also many other options that can be defined within the CreateUser command – a full list of these can be found on the MailStore Server Administration API Commands page. A nice next step would be including the ability to automatically read a populated csv file containing user information to make it even easier to import large numbers of users with a range of parameters. Whether my expertise can stretch to that I’m not sure so if you’re a bit of a scripting expert, please feel free to make yourself known! Hope that was useful – until the next time! As always, please leave any comments or questions below.